If you want to make the most of a small property, it pays to learn from others. 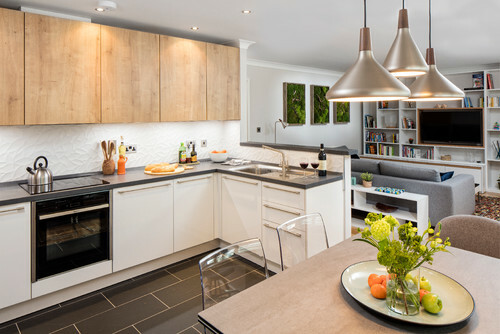 We’ve scoured our Houzz Tours and picked out some of the best ideas to help you plan your space and maximise every centimetre. 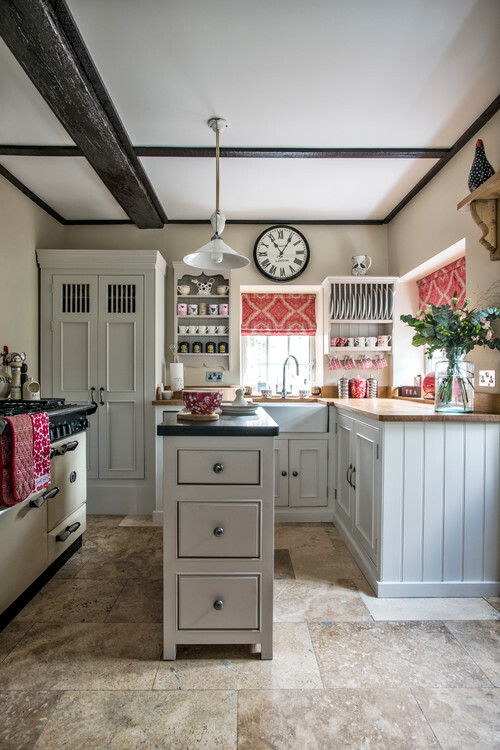 This compact kitchen is used for the owner’s jam-making business, so it had to be extremely functional. 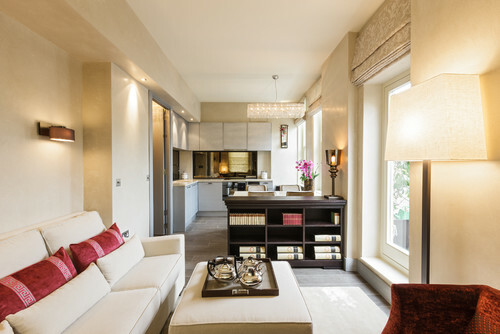 The designer, Jasper Middleton, design director of Middleton Bespoke, made the most of every millimetre of space. He even managed to squeeze an island into the room by designing one that measures just 1050mm x 490mm. It’s smaller than usual, but still provides an extra worksurface and handy storage. The cabinets here are custom made, but it’s possible to do something similar with freestanding pieces. Be creative and look for slim console tables that can be repurposed as an island, or a narrow chest of drawers that could be fitted with your own worktop. When we’re positioning furniture, we often use walls with uninterrupted surfaces and tend to ignore the ones with windows on them. However, if you want to maximise space, consider using the area below a window. In this open-plan flat, designer Amit Malhotra of Aflux tucked a sofa bed into the window alcove. It fits neatly below the sill to create a sunny seating area that transforms into a sleeping zone when guests stay over. Want to fit a cupboard into a small room? How about borrowing space from the room next door? That’s just what designer Irina Townsend of Keir Townsend did in this central London pied-à-terre. Either side of the sofa, Townsend built out the walls to create room for two wardrobes in the adjacent bedroom. The protruding surfaces have made a cosy niche for the sofa. “In such a compact flat, there was a lot of give and take,” Townsend told us. 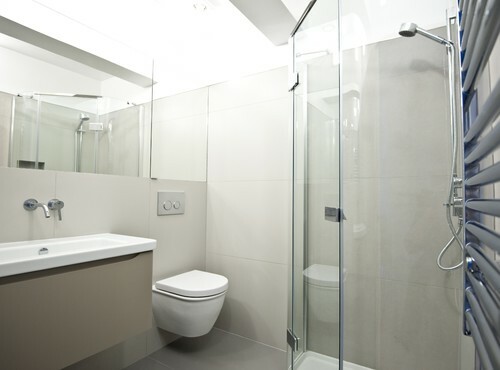 Slotting your essential sanitary ware into a tiny bathroom can be a challenge, but Olga Alexeeva of interior design firm Black and Milk Residential found the perfect shower solution for this small studio flat. “I didn’t want a square shower enclosure, as you would have been knocking against its corners all the time,” she told us. This diamond-shaped design was the answer, as it protrudes far less into the space and slots neatly into the slim shower tray below. “It saved my life!” laughed Alexeeva. In this cosy cottage, a fireplace provides the focal point in the small living room. To keep the rest of the room neat and uncluttered, Philippa Thorp of Thorp Design devised an ingenious way of hiding the TV. A false wall of books conceals a rise-and-fall mechanism which brings the television out when it’s needed. Consider opening up the walls to create a feeling of space. You don’t have to knock the whole wall down – removing just the top half will have the same effect. In this Dublin riverside flat, Dana Kallo of Black Fox Interiors knocked down the top section of wall between the kitchen and living areas. The small area of wall above the sink now acts as a splashback, and the room feels light, airy and much more sociable. When interior blogger Igor Josifovic moved into his one and a half room flat in Munich, he wondered how he would fit everything in. Clever space planning paid off, as well as his ability to make the best of awkward areas. Here, he has embraced the sloping ceiling and turned it into a sleeping nook. By painting the pitched roof a darker colour and hanging plants along it, he’s transformed a tight spot into a lovely retreat. 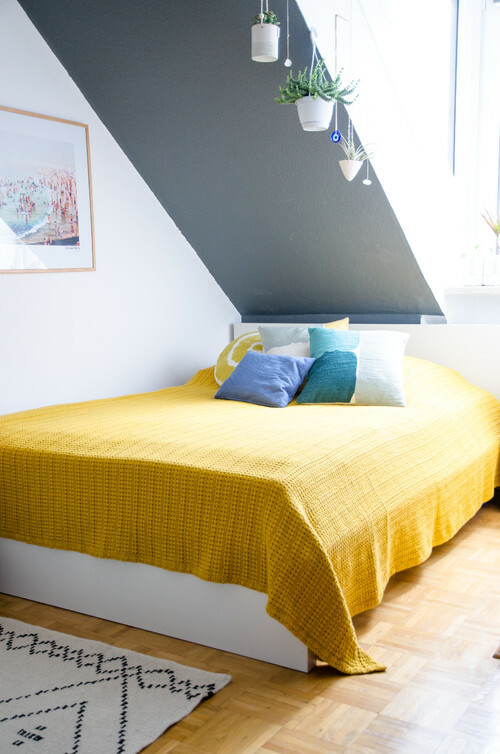 The bed space is separated from the living area by a partial wall, but the mustard yellow bedspread gives it a distinct look of its own. The key to making your home work for you is to think about your needs and how you can meet them. Sometimes that involves making bold decisions, such as turning a coveted two-bedroom flat into a one- bedroom one. 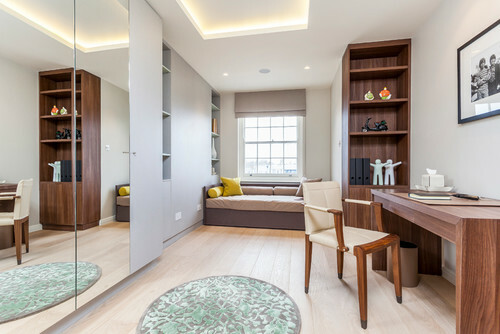 The two sleep spaces in this flat were tiny, so Ebba Thott of Sigmar came up with a controversial plan of reconfiguring them to create a large bedroom and walk-in wardrobe. 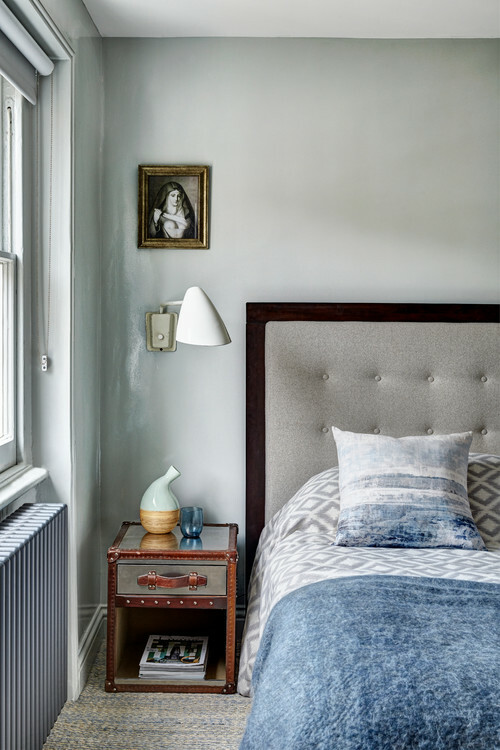 Dressing rooms aren’t just for big houses, as Chicago-based designers Katie and JoAnn Neenan of EM Interiors showed us in their guest bedroom. 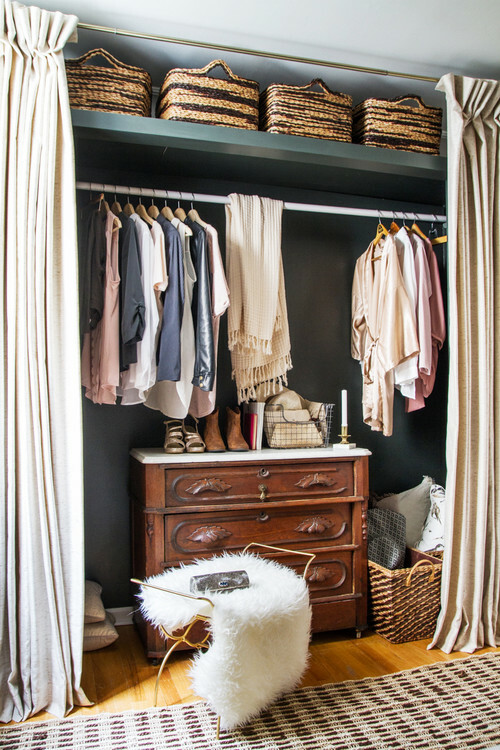 The sisters removed the doors of an old wardrobe to create this stylish dressing area. Natural fabric from a local warehouse has been used as curtains to close off the space, and jute baskets provide attractive storage. Come along to Grand Designs Live to find the latest trends and products to get your project off the ground! From kitchens and bathrooms, to interiors and build exhibitiors, find everything you need for your own Grand Design at this award winning event.